What's the Best Burger in Chattanooga (For You)? What’s the best burger in Chattanooga? 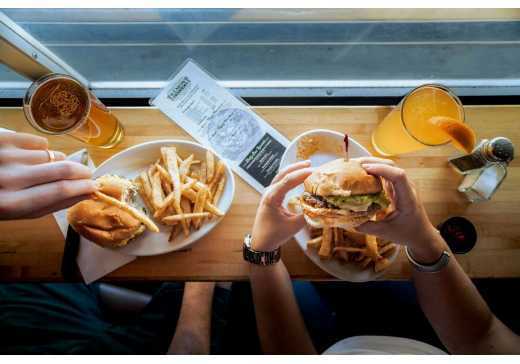 That’s a source of endless debate, which proves that burger lovers have plenty of options that are sure satisfy in the Scenic City. Chances are that you’ll love one—if not all—of these classics found around town. Here are six of the best burgers in Chattanooga, described by who might enjoy them the most. The burgers at Tremont Tavern are epic in both size and ingredients. A favorite post-trail hangout of the outdoor community, you’ll find Tremont packed with table after table of the young and hungry on any given night. The three-room tavern tucked away in North Chattanooga has been serving up cold beer and half-pound burgers since 2006, and local love for them has only grown. For your burger, start with a hunk of house blended Angus Beef and then make things interesting—the burgers range from the classic Tavern Burger (standard toppings and a Niedlov’s bun) to the downright indulgent Gouda Burger (smoked gouda, BBQ sauce, and fried onion straws). Things get even better on Thursday nights when your mile high burger comes with a free draft beer. Located on Chattanooga&apos;s Southside, Urban Stack is a must-visit for the burger lover in your life. The menu features killer burgers, manly drinks, and a variety of weekly specials. You&apos;ll find classic burgers and speciality stacks like the Good Day Sunshine (Certified angus beef topped with bacon and a fried egg), the Gourmet Bacon Cheeseburger (Kobe-style Wagyu beef topped with bacon-onion compote, gruyere, and blue cheese), and even a few vegan and vegetarian options like the Vegan on Shrooms and the Southwestern Veggie burgers. They also have a wide variety of bourbons and whiskies and plenty of local beers to try on tap. The 3rd Deck Burger Bar&apos;s claim to fame is its locale aboard the Southern Belle Riverboat. The dining room offers regular tables as well as living room-style seating, or you can head outside to eat and drink with a great view of the Tennessee River. 3rd Deck doesn’t get fancy with its burgers: Start with a half-pound black angus patty and choose your toppings by filling out a scorecard-type menu. Cocktails and beer, arcade games, TVs, and dart boards make this a great place for a group gathering. For a fantastic burger and fun atmosphere without a hefty price tag, Local 191 is your go-to restaurant. A popular place for Chattanooga nightlife, Local 191 offers a double stack cheeseburger for around $7 and extensive daily Happy Hour deals. Roll-up windows, high ceilings and discounted cocktails make this the perfect spot for hanging out on a summer evening. As its name suggests, Universal Joint appeals to the masses: Sports-lovers can catch just about any game on one of the giant flat screens, and everyone else can love the lively industrial atmosphere and huge menu. Located in an old service station, Universal Joint is cool and quirky without much effort. On warm days, the old garage doors are raised to make the restaurant open air, and outdoor seating nearly doubles its capacity. Topping options for the half-pound burger are standard but plentiful: choices range from bacon to jalapeños to sautéed mushrooms, and you can pile these on beef, turkey, chicken, or a veggie patty. The real kicker? Delicious, hot, crispy tater tots that come included with your burger. The fact that Main Street Meats is a local butcher shop and charcuterie pretty much says it all. By working solely with nearby farms that are dedicated to quality animal care, Main Street Meats is on a mission to create an ideal experience for the animals, the farmers and the community. Though you’ll find only one burger on the menu, don’t doubt that it’s spectacular in both taste and presentation. You’ll be served house pickles, caramelized onions, bacon, and gruyere atop a local beef patty. Add a side of house cut fries and your meal will be complete.